ROCKY MOUNT – We asked about a Rocky Mount tiller in an earlier post, visible just at the edge of a photo. Deputy Fire Marshal Lewis Smith in Nash County advises that the truck in the earlier photo is Truck 9 (below). He believes the unit was a 1949 100-foot American LaFrance tiller. The fire featured above occurred in the early 1970s at Sexton and Sons Feed and Seed Store located at the corner of Gay Street and Falls Road in downtown Rocky Mount. Truck 9 remained in service until Rocky Mount purchased Platform 10 (a 1977 85-foot articulating Snorkel). Truck 9 was subsequently sold to a movie company in Wilmington in the 1990s. Other readers have advised seeing it near Wilmington, unfortunately sitting outside and rusting. 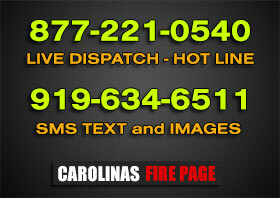 The picture at the top of the page shows Truck 9 fighting a fire at the Tarrytown Mall in Rocky Mount. At the time it was the largest covered mall in eastern North Carolina. Note the small utility trucks on the right side being used. Thanks Lewis for the additional information.